Last weekend, April 22-23rd, the IT-Eureka Hackathon was held at Kharkiv National University of Radioelectronics. Twelve teams that made it to the finals were invited to Kharkiv. There they worked on their projects non-stop during 24 hours and fought for the main prize – 30 000 UAH. Previously the IT-Eureka contest ran twice, in 2014 and 2015. At that time the contest was held as a part of the international Tempus project supported by the Ministry of Education and Science of Ukraine, the leading European and Ukrainian universities, and businesses. The aim of both the program and the contest were to develop the entrepreneurial spirit in students and give young people the opportunity to feel what business is, to learn how fresh ideas come to life, how they crystallize, develop, and become successful. 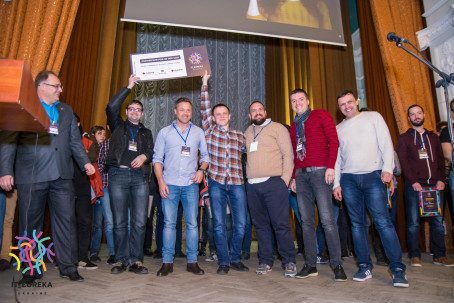 When the Tempus program came to its end in Ukraine, Sigma Technology and Sigma Software adopted the initiative to hold the event in Ukraine and be its main partners. Kharkiv National University of Radioelectronics became the main hosting partner of the competition. Projects selected as finalists were supposed to be innovative, competitive, and solve the existing problems of education via IT means. The students` teams from Odesa, Lviv, and Kharkiv gathered to develop a working demo during 24 hours of live coding, and then pitch projects to the jury. The jury included the representatives of the leading technical universities, as well as Ukrainian and Swedish businesses. All the presentations were held in English. Among the projects presented were solutions in different areas, including AR/VR, mobile, machine learning, and others. Some of the projects were remarkably mature, and young people showed them quite good at pitching, although for most of them this contest was their first experience of this kind. The team from Kharkiv National University of Radioelectronics, ARDex, became the contest winner. They developed an AR solution that makes it possible to create interactive content for modern training. The jury has also awarded the team of Kharkiv Computer College with a special prize for their project – an educational game for learning history. For more information contact Niklas Malmros, niklas.malmros@sigmatechnology.se.